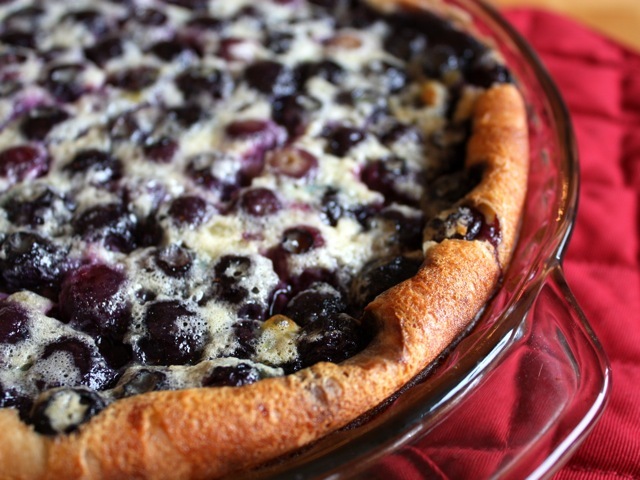 Clafoutis is a custardy-cakey confection that can be used as a vehicle for any fresh seasonal fruit. Berries, cherries, and fresh peach slices all work well. If you use cherries, consider replacing the Grand Marnier with Kirsch. Preheat the oven to 350 degrees. Grease two 9-inch pie plates with the 2 Tbsp. cold butter. Line the buttered dishes with the blueberries. Pour the batter over the blueberries and bake until just golden-brown on top, about 40 to 45 minutes. Serve warm or cold, as is or with ice cream or fresh whipped cream. Culinate editor's note: This clafoutis — essentially a baked custard-cake — is on the jiggly, custardy end of the clafoutis spectrum. For a less moist clafoutis — the kind you're likely to find in French patisseries — try Almost Classic Cherry Clafouti. And for a firm, dry clafoutis, make Anthony Bourdain's Clafoutis.